Hindu Mahasabha Celebrated Gandhi’s Death By Shooting His Effigy !! This Tamil Actor Could Not Tolerate !! On the death anniversary of Mahatma Gandhi, the Akhil Bharat Hindu Mahasabha celebrated his death and the ‘martyrdom’ of Nathuram Godse, the man who killed Gandhi on January 30, 1948. 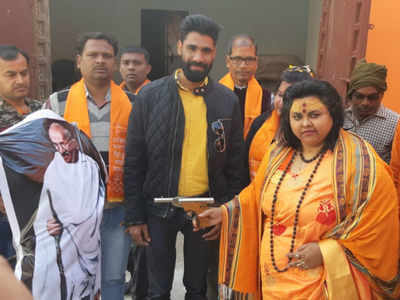 Hindu Mahasabha national secretary Puja Shakun Pandey shot at an effigy of Mahatma Gandhi on Wednesday, celebrating ‘Martyr’s Day’ in Uttar Pradesh’s Aligarh. After Pandey shot at the Gandhi, ‘blood’ was seen oozing out of the effigy. According to reports, Pandey also distributed sweets among her supporters and fellow Mahasabha members. Godse, who killed Gandhi, was allegedly associated with Akhil Bharat Hindumahasabha. Akhil Bharat Hindumahasabha has always celebrated Gandhi’s death anniversary as ‘Shaurya Divas’ or Martyr’s Day, but they have never gone to the extent of shooting at an effigy of the Mahatma in celebration. The fringe group of Shakun Pandey is not associated with the original Hindumahasabha. On Wednesday, the nation observed the 71st death anniversary of Mahatma Gandhi. Prime Minister Narendra Modi and President Ram Nath Kovind led the country in remembering the Father of the Nation. On seeing this news highly disappointed actor Siddharth expressed his thoughts through his official twitter handle. Siidharth who never shied away from conveying his thoughts on any organisation or product or company or political party. The actor did not wanted them to mention any religion to do whatever they please. ‘Hindu Mahasabha’ is the name of the group not a description………are u joking? Rename it to Hooligan Mahasabha. Nobody is using the word #Hindu to describe them. They identify themselves as one. It’s a cop out to blame the press, when it’s the Hindu mahasabha that it’s maligning Hinduism. No wonder. They are with ruling party. And @BJP4India with them. Will govt book sedition case and be called anti-national? Wha do you think on the actor’s statement ?/ Comment your views below !! Previous articleGautham Menon Got Mercilessly Trolled Like Never Before For This Reason !! Check Out !! Next articleActor Arya To Marry This Young Trending Actress !! Check Out When ! !